Did the official Star Wars Instagram share a photo of Star Wars: Episode VII’s Chewbacca costume? 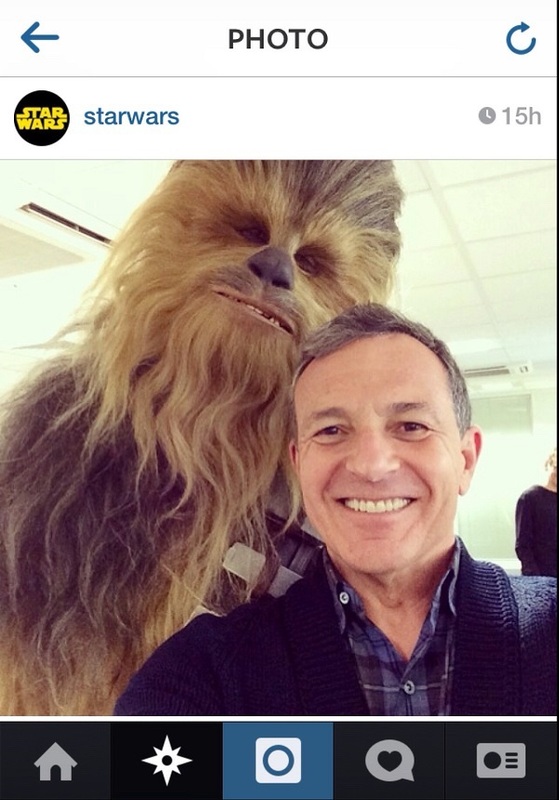 The Official Star Wars Instagram shared a picture today of Chewbacca with Bob Iger (he’s like the Emperor of Disney, man!). Some believe it might be the costume that will be used in Star Wars: Episode VII. It is really hard to say. I really don’t see Peter Mayhew’s blue eyes in this photo, but that might be the lighting. I did a fast check around the internet and I don’t see anyone shooting it down. As you can see the picture has been up for 15 hours, so a part of me thinks it was shot down somewhere, but like I said, I’m not seeing it. I guess at the end of the day, it could be Chewbacca from Star Wars: Episode VII, it might not be. The point is, you should probably follow the official Star Wars Instagram because one day it might be (if it isn’t already)! @MakingStarWars I honestly don't know. The image was supplied to is without much context. No idea where/when it was taken. While there was some European confirmation of the picture being for the new Star Wasr, it appears to be speculation on their part.